It's strange reviewing a book that isn't really a book. 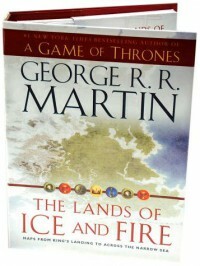 This book contains 12 maps of the world in which George R. R. Martin's amazing 'A Song of Ice and Fire' series is set (A Game of Thrones for those unfamiliar with the book series but know the HBO TV series better). The maps are absolutely beautiful. It's nice to be able to study them and see how certain things link up. For example, the first map is an entire map of the world, showing the precise location of Westeros in relation to Braavos, the Dothraki Sea, Valyria etc. which hasn't been seen before, and the scale as well is mind blowing. Most of the maps after that are then more detailed versions of different areas of the first, and I'll admit while some are interesting and mark locations mentioned in the books but not marked on the far less detailed versions of maps included in the books some do feel unnecessary (such as beyond the wall in my opinion). Probably of must use and interest is the Journeys map which shows the path each of the main characters takes from the beginning of Game of Thrones up to A Dance With Dragons. This is immensely useful and interesting to look at, but I felt that there needed to be a better key for whose path was whose as it took me a minute to identify a couple people's paths. Also, because they used the totally to scale map of the whole world (the first I mentioned above) I felt some of the paths were too generalised, and maybe a few smaller maps that showed more detail might have been nice. Speaking of, all the maps were the same size and quite large, and I felt that maybe a mixture of huge maps and smaller maps, where appropriate, might have been nice. And as noted, the Journeys map will obviously become dated with the release of the last 2 books in the series which is a slight let down and I wonder if an updated version of the whole book will then be released, and I only hope it is possible to buy an updated journeys map on its own for those of us who bought this edition. Overall though, an excellent set of maps that are really interesting to look at. A must for any true ASOIAF fan.